Oconee County Commissioner Jim Luke used the commissioner comment section of the March 30 Board of Commissioners agenda-setting meeting to offer his perspective on where things stand regarding future plans for the courthouse. No decision is imminent, he said. “I don’t think there is any possibility...that a shovel is going in the ground to dig any dirt in probably at least 10 years,” he added. On April 2, Luke told me in a telephone conversation that he was motivated to make the comments by the hope that the papers would cover what he said and reassure citizens. His strategy backfired. the Athens Banner-Herald reporter present ignored his comments. The Oconee Leader, as is usual, has not run a story on the meeting. The paper was right in saying that Davis and Horton concurred with Luke, but they concurred in saying that no decision is pending. Daniell didn’t say anything at all, and Hale was silent. So one out of five was right. In my telephone conversation with him, Luke elaborated by saying that he had talked with half a dozen people and none of them said they think the county needs to move forward at this time to build a new courthouse. Luke said that is his position as well, though he did say there are two reasons why the county might want to consider purchasing land at this time for construction of a courthouse in the future. The first reason is that land prices are low. The second is that the county is sitting on money from the 2003 SPLOST that was set aside for county facilities, including a courthouse. And Luke said he did not want to do what the Oconee County Board of Education did when it announced a decision back in December of last year, without public input, to purchase 6.6 acres of land in Watkinsville for construction of administrative facilities at some point in the future. The current round of discussions about the future of the courthouse also began in secret when Wayne Provost, strategic and long-range planning director for the county, called a meeting of 15 governmental officials for Dec. 17, 2008, at the request of BOC Chairman Davis. The Dec. 17 meeting wasn’t advertised to the public, and Davis greeted those gathered at the courthouse and then left when Commissioner Horton and then-Commissioner Don Norris showed up–creating a quorum of the Commission and making the meeting a clear violation of the state’s open meetings laws. Following that meeting, Provost came before the Board of Commissioners in March of last year with a proposal that the BOC issue a request for proposals for "architectural consulting services for county judicial and governmental administrative facilities." The Commission (without Davis speaking up) balked, however, and instead sent the issue to the Citizen Advisory Committee for Land Use and Transportation Planning for review. After a year of deliberation, that committee voted on March 9 to recommend that the county split its administrative and judicial offices and build a new judicial building near the current jail on Experiment Station road. The voting procedure was complicated, with each of the members given four votes, which could be used to vote for four conflicting outcomes, one outcome four times, or any combination of outcomes. The Committee has 14 members, but only the chair, Abe Abouhamdan, and eight other members showed up to vote. Abouhamdan did not cast his four votes, but another member sent in a proxy, meaning that 36 voters were cast. The first outcome, moving all governmental functions to one new location, received five votes. Putting the administration and judicial functions in separate places, with the administrative offices staying at the current courthouse and a new judicial facility being built near the new jail, received 20 votes. Putting the administration and judicial functions in separate places, with the administrative offices staying at the current courthouse and a new judicial facility being built near the courthouse, got six votes. No one wanted to separate the administrative and judicial facilities but put the judicial facilities in some other location. And no one voted to do nothing. Putting the administrative and judicial facilities in some structure that also combined school administration facilities got five votes. Approved minutes will be sent to the BOC after the Committee meeting on April 13, he said. And the Committee might not be finished with its work. He also said the commissioners want to know, “should we go ahead and utilize SPLOST funds that were collected in the previous SPLOST and earmarked” for courthouse expansion. The SPLOST–or Special Purpose Local Option Sales Tax--is the problem. If the county just sits on the money, it has to admit that it asked citizens to pay a tax for something that wasn’t needed at the time and is not needed even now. Only a little more than 10 years ago, in November of 1998, the county completed a renovation of the current courthouse that doubled its size. The original building had been built in 1939. Just less than five years the later, on Sept, 2, 2003, the BOC said it needed to expand the courthouse again, and it voted to put onto the November 2003 ballot a SPLOST authorization that would gather a projected $4.6 million. Of the current Board members, only Davis and Hall voted on that authorizing ordinance. Horton and Luke joined the Board in January of 2005, and Daniell joined in January of 2009. Neither Davis nor Hale–nor anyone else–has come forward during the current discussion of the courthouse to say publicly what the BOC had in mind when it voted for that $4.6 million authorization in 2003. During the public meetings leading up to the vote by citizens in March of 2009 to authorize a new SPLOST, the unspent monies from the old SPLOST were not discussed. The county collected the $4.6 million for the courthouse and other governmental facilities, and $4.2 million of that remains unspent. 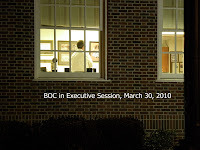 On March 11, 2005–or 18 months after the BOC voted to ask voters to approve collection of the $4.6 million for the courthouse, the county got a justification for that decision. On that date, Brian Gene Nichols escaped from custody in the Fulton County courthouse and murdered the judge presiding over his trial, a court reporter, a sheriff’s deputy and a federal agent. Around the country, this tragedy became a rallying cry for more security at courthouses. Oconee County Sheriff Scott Berry joined the chorus and has argued that the current Oconee County courthouse, with the intermixed court and administrative functions, is unsafe. Berry made that argument to the Land Use and Transportation Planning Committee, and Provost has repeated it frequently in deliberations of that body, saying that administrative and court functions needed to be separated. The vote of the Committee on March 9 indicates the argument was accepted. Commissioner Luke’s comments at the BOC meeting on March 30 were meant, he said, to give his view of what might happen next. He used the 10-year figure as when he thought the county actually would start building something. WGAU’s Tim Bryant asked Chairman Davis on Feb. 16 about the courthouse. “What is the level of need right now?” Bryant asked. “We’re ok right now,” he said, “But we do have an issue with our court functions.” He said security was a concern, and administratively “services are not as efficient as they could be” because of crowding. Davis also made reference to the expectation that the county will ask voters again in 2015 to approve a new SPLOST and said money for a courthouse could be included in that. The current SPLOST does not set money aside for that purpose. So Davis is advocating much earlier action than is Luke. The BOC can keep the public in the dark on decisions on land purchases for a courthouse, as land acquisition is one area exempted from the provisions of the state’s open meeting laws. This Commission makes frequent use of executive sessions, and it held one after the session on March 30 when Luke made his comments. 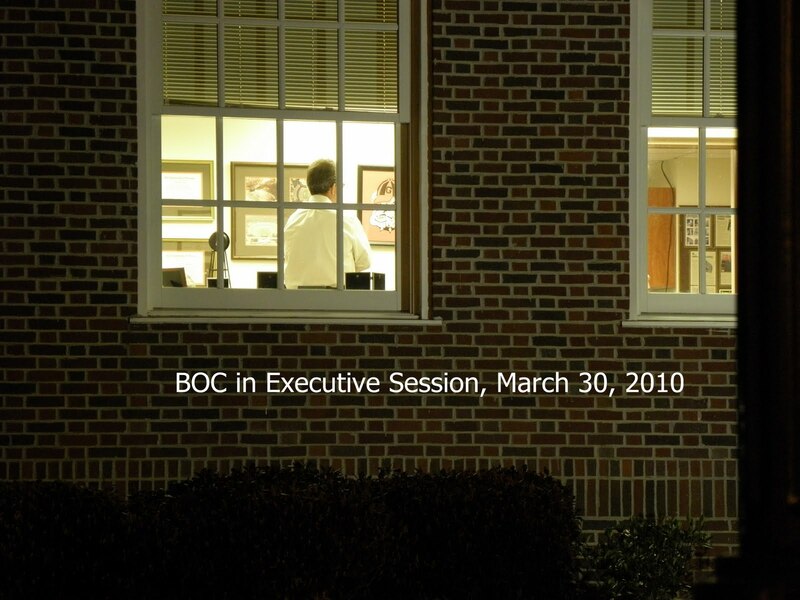 That open part of the meeting lasted until about 8:45 p.m. When I left the courthouse at 9:30 the Commission was still meeting in Davis’ office with the county attorney. From the street outside I could see that Finance Director Jeff Benko, Administrative Officer Alan Theriault and Planning Director B.R. White also were present. The official minutes of the meeting did not report on when the meeting ended, who attended or what was discussed. Luke made a point of saying that the public will be involved in whatever decision is made. On that, Davis and Horton really did concur. A recording of the entire March 9 meeting of the Land Use and Transportation Planning Committee was made by Sarah Bell and edited by me. It is on my Vimeo site.